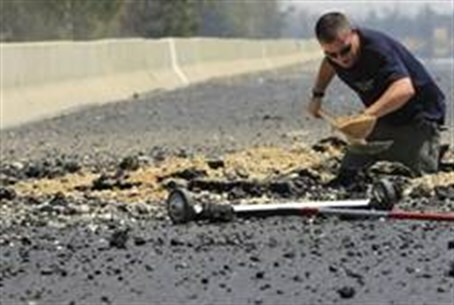 Two Qassams fired from Gaza struck near a roadway between Shaar Hanegev and Sdot Negev; a Grad struck near Beer Sheva. A pair of Qassam rockets fired from northern Gaza on Thursday evening struck near a roadway between Sha'ar Hanegev and Sdot Negev regional councils in the Negev region. A Grad rocket also landed in the outskirts of Beer Sheva. No physical injuries or property damage were reported from the attacks. According to local sources a “Color Red” alert siren was not initiated in the Gaza belt during the attack. Security officials say they are investigating the failure. The attack comes after a joint IDF and ISA initiated airstrike on a terrorist squad from the Al Aqsa Martyrs Brigades. The precision attack destroyed a car parked on Omar al-Mukhtar in Gaza City and resulted in the deaths of at least two terrorists. One of the terrorists was Issam Ismail Subhi Batash, 43, who security forces say was a senior planner for the Al Aqsa Martyrs Brigades. Earlier this year, Batash was involved in planning attacks in southern Israel from Sinai that resulted in multiple civilian casualties. In January 2007 he helped plan the suicide bombing in Eilat that killed three Israeli civilians. In recent years he is said to have been involved in numerous attempts to carry out attacks in Israel – most of which were thwarted before they could be executed. MK Danny Danon responded to the attacks by asking Defense Minister Ehud Barak to strike scores of targets in Gaza. "Rockets from Gaza target all residents of Israel's south," Danon said. "I approached the Minister of Defense and asked him to strike 60 Hamas targets in Gaza. If our citizens have to spend time in shelters, then we should ensure Hamas remains underground for life." "Haniyeh should be forced to watch the world through the TV screen in his bunker. Whoever tries to harm Israel should be struck down," Danon added.